No chicken sacrifice required for this mystic ritual. Watch enough anime or play enough Japanese video games and eventually you’ll come across magic circles, or mahoujin (literally “magic formations”) as they’re called in Japanese. 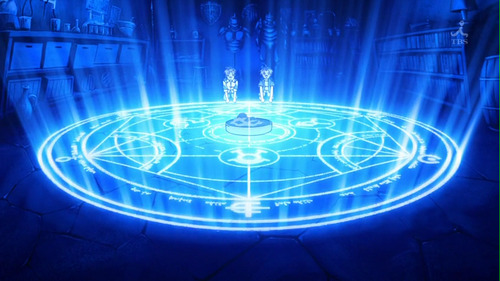 With an intricate yet organized pattern of symbols and runes laid out in a circular array, they make frequent appearances in both the Fullmetal Alchemist and Star Ocean franchises, and are no doubt the product of plenty of time and effort put in by their artists. But it turns out there’s a way to make a magic circle, and in real life no less, with hardly any difficulty at all. The technique was recently discovered by Japanese Twitter user @aa91066452, and all you’ll need is a flat surface, a ray of sunlight, and a can of Monster energy drink. Why Monster? Because the beverage has a list of ingredients as long as the one of extreme sporting events it sponsors. And while nutritionists may frown at the idea of putting so many artificial sweeteners and stimulants in your body, having to list them all on the can means that when the light strikes it just right, this happens. The abundant text becomes reversed and inverted as a result of being reflected, giving it the appearance of an ancient, mystic language. At the same time, the arced layout lends a sense of systematic design, imparting the impression of secret knowledge from a civilization buried in the mists of time. Taking that last comment into consideration, we have to ask our readers who are tempted to recreate @aa91066452’s results to do so only after finishing your energy drink. That way you’ll have the necessary pep to fight whatever demon or elemental comes out of the magic circle, or at least the caffeine-fueled jolt of energy needed to outrun it. Follow Casey on Twitter, and maybe he’ll appear in the next magic circle you create.